I received this book through The Reading Room/Bookstr in exchange for an honest review. I requested this book because I liked the cover and the idea of a witch who is dyslexic. I was blown away when I finally read it. 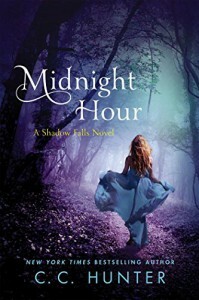 This is the first book I have read in either of the Shadow Falls book series, but after reading it, I am thinking of going back and reading the other books. I'm not a huge fans of romantic books or love triangles and while those elements are incorporated into this novel, there is tons of other stuff going on, which make it a great read. The book flows through various struggles from the everyday (test-taking, studying, romance, friendship, fights with parents) to the extreme (kidnapping, crazy warlock conspiracies, being wrongfully accused, undercover work, evil family members). This book basically has it all. It combines romance with the paranormal and criminal investigations. And it is so entertaining. The thing that really interested me about this book initially was that Miranda is dyslexic. At the beginning of the novel, Miranda views it as "a curse" and struggles with it. But by the end, she realizes it is "a gift". I think Hunter did a pretty fair job of showing how dyslexia can make some things harder, but it also helps people see things in a different way than non-dyslexic people. The narration doesn't go into too much detail about what it is like to have dyslexia, but it expresses an overall attitude about accepting it. My only critique is that this is a huge book. It's a little over 400 pages long. It only took me about two weeks to read because I was so engrossed in it, but my thumb is killing me after holding is open for so long during binge-reads. There are a few slow moments that didn't seem necessary and could have made the book more concise if they'd been cut. It kind of drags on at times. But overall, I found it fascinating and really enjoyed the writing and the characters. This seems like one of those series you can just lose yourself in. Thanks a lot, C.C. Hunter. Now I have to go back and read the other eight books (and short stories). You have found yourself a new fan.